I am embarrassed to admit that last night was the first time I have ever watched a women’s hockey game from start to finish. A terrible sin, I know. I had seen periods from games or seen bits and pieces, but for a host of reasons I’ve never been able to sit and watch a women’s game to completion. But I’m glad I finally did. 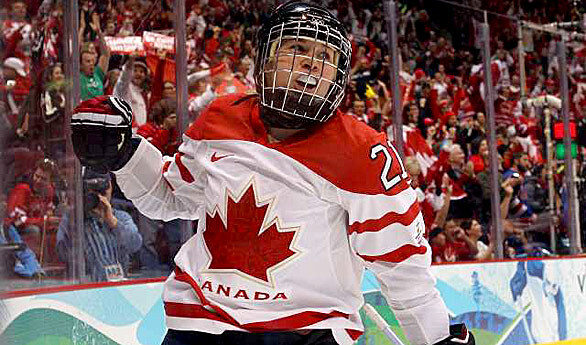 It was the perfect game to watch as Canada held on to an early 2-0 lead to down their arch-rivals from the United States and win their third consecutive Olympic gold medal. There was a lot to like about the match-up. As the prohibitive favourites in any international tournament, the North American teams had often locked up at the highest levels of competition, whether at the Olympics or World Championships. As a result, the two teams are very familiar with each other’s tactics and strategies. It quickly became apparent that women’s hockey has a style all its own thanks largely to the prohibition of body checking. Personally, I’ve always thought this was a sexist rule that implied that women were too fragile to withstand physical play. It just made no sense – why could a woman not safely hit another woman? They would be physical equals, with no particular danger of injury. However, the lack of big hits means that the scourge of entertaining hockey – the Trap – is impossible. The resulting game is fast and free-flowing with few stops in play. It’s refreshing compared to the National Hockey League where clogging the neutral zone has often been the fastest way to the playoffs. The players on both teams were exceptional passers and play makers. Throughout the game there were creative tape-to-tape passes generating scoring chances. The Canadians in particular had a knack for finding each other on the ice. When they had those openings, the Canadians were patient, waiting for defenders to over-commit themselves to a blocked shot. Canada often exploited their opponents’ mistake with a sharp pass for another quality chance. It was inspiring hockey. Team Canada was also impressively dedicated to defence, dropping to their knees to block shots and passes, fending off a 5-on-3 power play for nearly a minute and a half at the start of the second period. It was a lot of fun to watch, with both teams evenly matched. That said, I don’t regret missing any of their other games. They were all lopsided blowouts that made me feel bad for the have-nots in women’s hockey. This is the sport’s greatest weakness – only a Canada-USA match-up showcases the very best of the game. Every other pairing is horribly one-sided. When the next world championship rolls around, I’ll make sure to watch – as long as the game has Canada and the USA in it. A side note: The fact that Team Canada had to apologize for their celebratory drinks and cigars on the ice is utter nonsense. The arena had emptied out and they were revelling in their success in what should have been a private moment. They should be allowed to let their hair down, guilt free. I won’t go on any further, as too much ink has already been spilled over this story.